All the World is a poem in the form of a picture book. 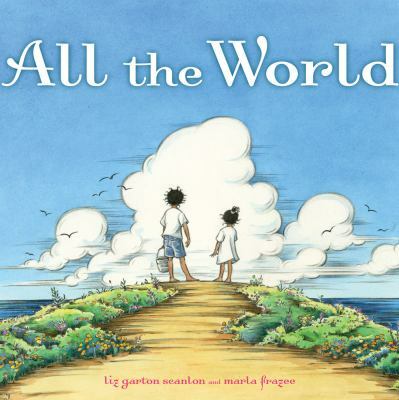 It was written by Liz Garton Scanlon and illustrated by Marla Frazee. 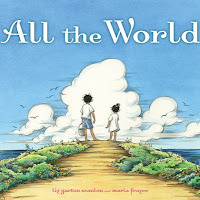 It was selected as a 2010 Caldecott Honor Book. The author has created a curriculum guide to help teachers use this book in the classroom. Simon & Schuster published this book and they interviewed the creators about how the book came to be as part of their Behind the Book series. You can watch the trailer for this book on YouTube. School Library Journal suggests this title for children in kindergarten to 2nd grade and Publisher's Weekly suggests it for ages 3-7. This is one of the ten titles nominated for the 2010 Ladybug Picture Book Award.